Author Donald E. Aylor, Ph.D., has more than 40 years of experience modeling and conducting experiments in aerobiology using a variety of crops and propagules, techniques, and mathematical tools. His high-quality research in this area is nationally and internationally recognized. The dispersal of pollen and spores by wind is central to some of the biggest challenges in science today, such as the spread of food-supply-threatening plant diseases; the rapid and widespread adoption of genetically modified (GM) plants in agriculture and their potential for pollen-mediated gene flow in the environment; and the presence and role of bioaerosols in cloud processes. Aerial Dispersal of Pollen and Spores is a unique, valuable, and comprehensive 432-page reference covering the many complex factors and effects encompassing the movement of spores through the air. It synthesizes material scattered across the literature of multiple disciplines in one single place—and adds many insights through new research in this important area of study. It uniquely emphasizes the critical, interacting biophysical processes that control the dispersal of particles in the atmosphere. By shining a greater light on these biophysical processes, scientists will get many new and valuable perspectives that can be applied to their research and to understanding models behind the spread of pathogens and genetic material in the atmosphere. 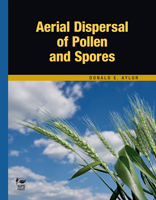 Aerial Dispersal of Pollen and Spores serves as a valuable reference for researchers, graduate students, and advanced undergraduates in the fields of plant pathology, plant biology, meteorology, agronomy, and agricultural engineering. It is also well positioned as an important teaching resource across several disciplines, including plant pathology, botany, and aerobiology. Researchers and practitioners to evaluate the relative importance of nearby and faraway sources of inoculum. Breeders to assess outcrossing potential and pollen mediated gene flow (PMGF) in the environment. Botanists to evaluate physical characteristics of pollen and spores. Plant biologists to access information typically assessable to physicists, leading to the undertaking of more quality interdisciplinary studies. Aerial Dispersal of Pollen and Spores covers dozens of topics within the study of pollen and spore dispersal, such as the physical properties, forces, and processes affecting pollen and spores—in motion and at rest; pollen and spore survival; infection and fertilization efficiency; wind and wind transport models; cross fertilization; pollen mediated gene flow; precision agriculture practices applied to aerially dispersed pathogens; infectious periods and opportunity for disease spread; aerial sampling, and more (for a more comprehensive list of topics, view the ‘Contents’ tab). Why Does WSR Spread Faster Than TBM?